The Packard Street Rod Association was founded on May 3, 2013, during the NSRA Nationals South in Knoxville, Tennessee, by four individuals who own and drive Packard street rods. These individuals started the PSRA with the idea that building, owning and driving a Packard street rod is a unique experience and therefore, the knowledge gained during this process should be shared with other Packard street rod owners. 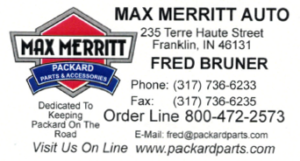 Whether you are looking for a part for your Packard, information on what works and what doesn’t work, or you want to share some of your knowledge, feel free to contact us. Please browse through our website for club newsletters, classifieds, events, photos, membership information and contact information. In “Member Photos” click on the title or the small picture to read the description and see more pictures of each Packard. To protect the privacy of our membership, we do not post personal contact information on the website. To contact a member of PSRA, submit your request to the chairman or website administrator. See Contact Us. Packardstreetrods.com is available to all members of the Packard Street Rod Association thanks to our sponsors. 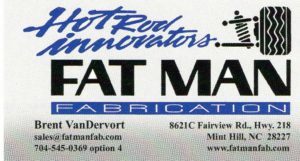 Please support our sponsors when building or repairing your Packard street rod. Just click on the website address to visit them on line. Tell them you saw their ad on Packardstreetrods.com. Ask the man who drives one.